At first glance from the previews chosen for television one guy might think “Chick flick. Oh look they threw sports in to try and get me to come watch.”. Don’t worry I thought the same thing and pretty much had a preconceived notion of what I was expecting from the film. Yes I know I am supposed to be objective and go in with an open mind, but sometimes it is hard not to. At least I am honest about it. What I was expecting and what was delivered were two different things and this is a good surprise. The movie is written and directed by David O. Russel of “Three Kings”, “The Fighter” and, of course the classic “Spanking The Monkey”. The movie and screenplay are based off of the novel by Matthew Quick. 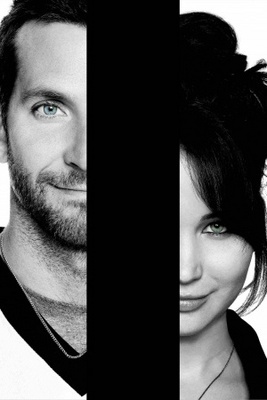 This cinematic feature encompasses the quick whit of both Bradley Cooper (Pat) and Jennifer Lawrence (Tiffany). Add in dashes of Robert DeNiro, Julia Stiles and Chris Tucker. With all this talent in one movie it was a miracle they were not overused nor under done. The movie starts out with Brad Cooper’s character, Pat, while he stands and stares out the window from his room in a Baltimore Mental Institution. Your first thought is “How did he get there?”. Don’t worry. The movie does a good job answering this for you. Pat gets a ride from his loving mom (Jacki Weaver) out of the hospital as he is discharged. Once home you can tell that there is some mixed emotions in the house about how the parents feel about Pat. Pat’s high school picture lays against the wall as the sun stained shadow of its former place on the wall shows a reminder of what things were at one time. Robert DeNiro and Jacki Weaver do a fantastic job of playing confused evolving parents even at their age. Pat Sr and Delores still love Pat but just want him to be normal or their version of normal EVEN THOUGH Pat Sr. has OCD tendencies. These can be seen while he watches Eagles games. Pat Sr. and many members of the family and friends are huge Eagles fans. Being retired, Pat Sr. takes on being a bookie to help supplement his income and to achieve his own goal of opening up a cheese steak diner. Sure you could draw similarities between Junior and Senior and how their goals become consuming but I am not writing a 6th grade book report and your not here to read about literary character development. The movie goes on to show the collision of Pat and Tiffany. I say collision because after a forced dinner at Ronnie and Veronica’s (Julia Stiles) house these characters have as much friction as the Tectonic plates. But much like the push and pull of the plates, these characters find themselves helpful in each other’s lives. Pat has the same push and pull with his dad who has to learn and accept his faults as well. You can find this quick plays of drama through out the film with a small undertone homage to Philly Phans. I am assuming this because Bradley Cooper is from Philly as well. The story arc is a slow rise towards the top with an explosion of emotion and then David O Russel and Company literally double down at the end hoping that you will sit just a bit longer to see the conclusion and start of the many relationships that are in Pat’s life. The movie hits you at times with good cuts of humor brought on, of course, by Chris Tucker’s character, Danny, but also by Bradly Cooper and Jennifer Lawrence. I would recommend this film to everyone who likes quirky characters thrown into a small suburb of one of the nation’s most violent sports cities.